Dear Harry Reid, this spells trouble for you. A lot happened on Tuesday’s elections. Before anyone can heave a sigh of relief at how the negative ads and all those pesky phone calls are finally going to come to an end, it’s important to remember that, although this sure felt like the election to end all elections, it isn’t. In fact, rankings are already out for the most vulnerable senators going into the 2016 elections (spoiler alert: Ron Johnson is at the top of the list). However, I think it would be fun to look at what happened in Harry Reid’s home state on Election Day, because it didn’t get nearly enough attention as it should have gotten. To begin with, I don’t think Reid is going to be in the senate after the 2016 elections (but more on that later). The easiest way to examine what happened in Nevada is to start at the top of the ticket and go down the ballot. Governor: Brian Sandoval won reelection. By a lot. By 70%. That’s about 3 times the amount that his Democratic opponent got. Wow. Not only did that happen, Sandoval carried every single county. This is bad (read: terrible) news for Reid. Why? Well, first off, Sandoval beat Reid’s own son for governor 4 years ago (where he also won every single county). It’s also bad for Reid because Sandoval is one of the best candidates to take on Reid in the senate election, given his sky-high popularity and the fact that, unlike Reid’s last opponent, he doesn’t have a tendency to say stupid things. However, this might not have mattered if things had turned out differently. However, they didn’t. Lieutenant Governor: Republican Mark Hutchinson was elected to this position. Why does this matter? To put it simply, if the Democrat had won, it would have been a lot harder for Sandoval to run for senate because, if he were to win, he would be succeeded in office by a Democrat (Governor and Lieutenant Governor are elected separately in Nevada), which is probably something he doesn’t want to happen. This is exactly what Reid would have wanted, which is why he was pushing so hard for Democrat Lucy Flores to win the race, however she was crushed, 59.5%-33.6%. Attorney General: this was a fascinating race because Republican Adam Laxalt is the grandson of Senator Paul Laxalt…and also the illegitimate son of Senator Pete Domenici, which was only revealed recently. Crazily, Laxalt’s family caused him a lot of headaches. Several of them actually endorsed his Democratic opponent Ross Miller, which definitely has to make for some awkward family dinners. 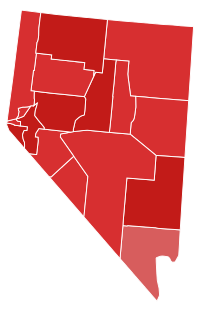 For most of the campaign, Laxalt was regarded as the underdog, but given how terrible the Democratic turnout was statewide, he managed to pull off an upset win, winning 46%-45%. Congress: for most of the cycle, nothing too interesting was happening here, but a few weeks before the election, there was a growing sense that dismal turnout on the Democratic side was putting freshman Democratic Congressman Steven Horsford in jeopardy. On Election Day, Republican Cresent Hardy (what a great name) won by just under 3 points in a district that Horsford had won by 8 points just two years ago. If Democrats had turned out, this probably never would have happened, but their complete lack of a credible candidate for governor demoralized their base. As Jon Ralston, one of the best reporters in Nevada observed, Democrats were in “big, big trouble” with their turnout, and got swept out of office in a race that was never on anyone’s radar until the very end. As if all of this wasn’t enough, Republicans took control of the State Senate, which they now hold by a one seat margin. Harry Reid was so busy trying to keep the majority (that didn’t turn out too well) for national Democrats that he forgot to pay attention to his own state, and two years from now, he’s going to regret that decision.